Regardless of its size or degree of formality, every wedding from an intimate gathering to a grand reception has certain unspoken rules for what you can wear as a guest. While some invitations do give clear definitions or instructions for a certain dress code, many others don't. Dress codes can range from straightforward or thematic ones like "1920s" or "casual attire (jeans allowed)" to simply colors like white, black, or even "summer palette". In this case, you might wonder, is it okay to show up in a cocktail dress? Or should you be more formal? Before you even start learning more about dress codes, let's learn about the basics first. Understanding your body shape will get you through countless wardrobe dilemmas. By choosing an outfit that suits your body type, you'll not only get a perfect fit that accentuates your best features but also avoid any wardrobe malfunctions. Check the infographic below to see which dress silhouette suits you best. After you've discovered the best dress silhouette for your body type, let's move on to the most common dress codes written in wedding invitations. This is the most formal wedding attire. Think the Oscar's or a state dinner. For her: A formal full-length gown or even ball gown in basic colors like black or any dark shades, complete with dramatic jewelry, neat hairdo, and a classy clutch if necessary. For him: A tuxedo or a long black jacket with tails and a white formal shirt, bow tie, finished with black formal shoes and gloves when needed. Just like the White Tie, Black Tie is also one of the most formal wedding dress codes. It usually indicates that the wedding is going to be in the evening. For her: A chic formal floor-length gown or a cocktail dress should be fine. If you want to keep the formal look, always try to keep your dress length below the knee. For him: A tuxedo, cummerbund, or black vest with a black bow tie. Complete the look with patent leather shoes. If the wedding is during summertime, you can always switch the tux with a traditional black suit. This dress code is less formal but still dressy and conservative. For her: A long dress or cocktail-length dress, a formal two-piece outfit could work too. Always remember to keep it formal by choosing a dress that is at least knee-length. You can play around more with colors with this type of dress code. Try to get hints by looking at the time of the event. Pick darker shades for an evening reception and a lighter soft pastel color for a daytime event. For her: Cocktail-length dress or maxi skirt with dressy top. For him: A suit and tie with more flexible color options, it does not have to be in darker hues. There is more flexibility for this one. Try to play around with bolder colors, fashionable accessories, also strapped or uniquely-designed heels. For her: A cocktail or tea-length dress with fun colors paired with playful accessories. For him: A suit and tie, non-white formal shirt is allowed, can be jazzed up with a different color tie or bow tie. This is the most informal dress code. Most weddings with this dress code are held outdoors with a laid-back atmosphere. Even though it is casual, try to avoid wearing jeans, tank tops, and shorts unless stated otherwise. For her: Summer dress or jumpsuit with light make-up and natural hairdo is acceptable. For him: Dress pants in khaki or other colors matched with a button-down shirt or dressy polo shirt. Though the dress codes above are often used in many types of events, these days there are other types of dress codes that would probably leave you wondering. Some dress codes are even not plainly stated, so you need to find some hints before deciding what to wear. Here are some potential dress codes you might encounter for a wedding. This includes the "Gatsby" or 1950s wedding themes. When it is clearly written, try to research outfits and looks from that specific era and look for similar clothing in your nearest thrift shop. For example, the 1950s was known for its fit-and-flare dresses that emphasized the female figure, while "Gatsby" alludes to the 1920s, a glamorous era famous for its black or gold flapper dresses. For her: Choose a black or gold dress with hanging fringes or beads and top it with pearl jewelry and a whimsical hairpiece. For him: A black suit with a bow tie would be the safest option, but as this is a more playful party, you can opt for other colors and patterns. Take some time to find accessories, like a hat or suspenders. Most destination weddings are held on the beach, so your attire should be dressy and at the same time relaxed and comfortable enough to wear in hot weather with sand between your toes. This also applies to al fresco weddings, such as a garden wedding where you can wear a floral summer dress and dressy sandals. For her: For windy places, avoid fluttery dresses that can be blown away. Play around with patterned or colorful cocktail dresses, keeping the length up to just above the knee. Wrap up the look with accessories and fashionable sandals or wedges. Due to the wind, keep in mind a hairstyle that embraces the surroundings. Unless you're sure about the venue, stilettos and any high heels that can get you stuck should be avoided. For him: Button-down shirt with khaki pants, try to avoid jeans and shorts unless stated otherwise, and bring along sunglasses or a hat as accessories. Some couples hesitate to write down any dress code to avoid appearing troublesome. However, when they want their guests to blend in with their wedding theme, sometimes they will write indirect "dress codes" in sentences like, "Our happiness will be complete with your presence, see you on our colorful wedding day" that implies that their guests should be dressed in colorful attire. For her: Always try to match the intended color, if not, you can choose for more neutral and monochromatic dresses. For him: A suit and tie or formal pants with a shirt and tie. If no dress codes is written or implied, you're free to wear anything you want. A little black dress or dark dress in any shade will never go wrong. If you're going as a couple, you can try matching your dress with his formal shirt using similar tones. For her: Little black dress, any formal dress, or dressy separates. For him: A suit and tie or a formal shirt with any tie. Another way to dress up for any kind of wedding occasion is to first determine where the wedding will be held: a garden, beach, or ballroom. Next, you should consider seasonal colors: spring, summer, fall, or winter. To make it easier, take a look at the color chart here for the options. If you really aren't sure about what to wear, you can check out some photos from real weddings to get an idea of what the guests are wearing to different types of events. Every kind of dress needs accessories that can make it stand out even more, but without the right balance, you might end up looking tacky. Always try on the complete outfit days before the event to give yourself some time to add or remove anything from your look. If you have difficulties in mixing and matching your outfit, follow these guides for some ideas. Elegant jewelry with a pair of classy sparkly heels. A cleaner look with less diamonds and a pair of neat, timeless heels. Dress up according to folks in that era. For 1950's, Dior's snug fit dress happened to be an iconic style. Playful yet fashionable accessories, always with a choice of colorful attractive heels. Flowery look with stylish accessories, combined with casual wedges or ballerina shoes. Maxi or knee-length dress with gladiators or fashionable slippers, sunglasses, and a hat. Aside from the invited guests, there are also other important guests who attend the wedding, including family and bridesmaids. Traditionally, close family members and bridesmaids dress up in uniforms of similarly-colored gowns. 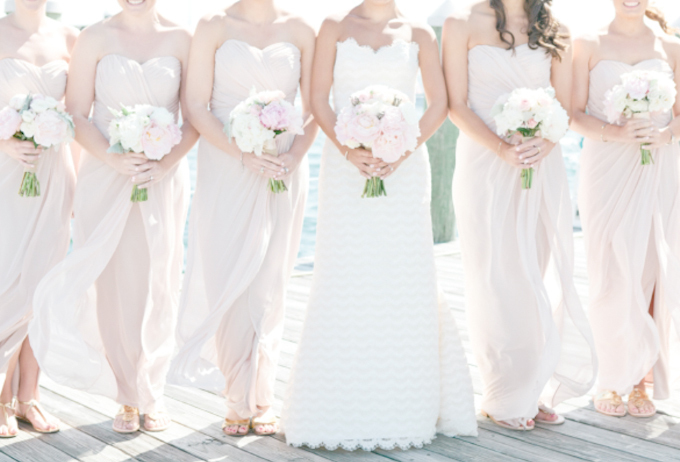 For bridesmaids, it's common to share the same design, while family members usually use identical materials while catering the design to each person's preferences. 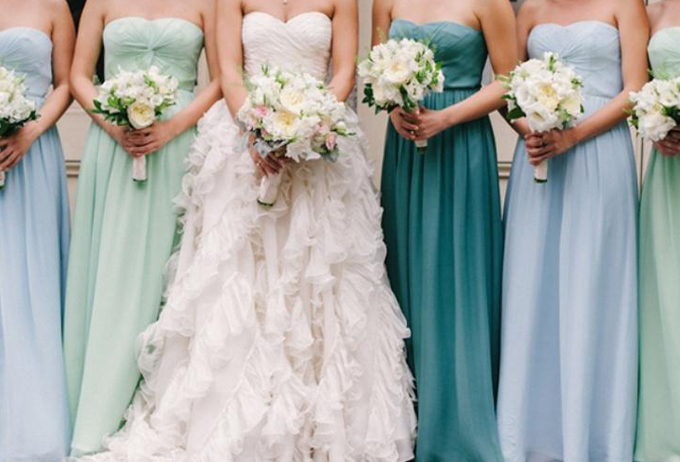 In recent years, the trend of mismatched bridesmaid dresses seems to have taken the spotlight. Learn some tricks to get a harmonious look even if you've chosen different colors, styles, or both. This is the most conventional style, in which all bridesmaids wear uniform dresses with the same design, color, and material. 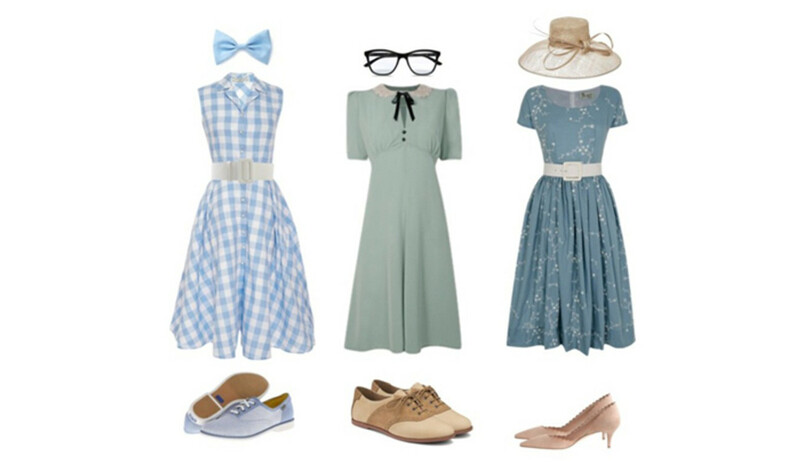 A modern look, with dresses in the exact same colors but with different styles. The key to this look is using the same material for each dress. You can choose to have an absolutely different color or you can limit it to certain shades of the same prime color or a thematic color palette like pastel hues, for example. This is the most non-traditional bridesmaid look. 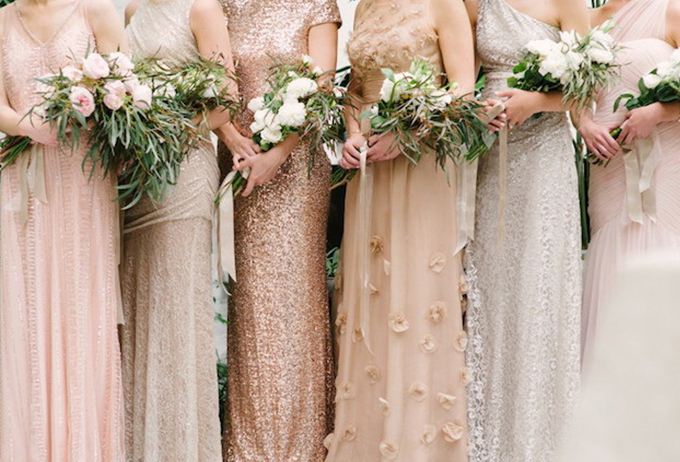 Even though you will have a totally different dress for each bridesmaid, you still need to set a specific tone or theme, such as bohemian or sequins. Even if you encounter an uncommon dress code, always look into your own or your family's wardrobe instead of buying something new. If the dress code is "vintage", for example, you can try asking your mother or even grandmother for a one-of-a-kind outfit. Always try to follow the dress code, if there is any, and ask for honest opinions from your closest ones. Being visibly overdressed or underdressed can make you feel uncomfortable throughout the party and stick out like a sore thumb. Thanks to websites like Pinterest and Polyvore, you can easily explore unlimited possibilities when it comes to style. Try to get an idea and adapt it with your personal style and existing wardrobe. Even though people are now more open-minded and lenient about guests who wear white, it's always a smart choice for you to exclude white when there is no obligation to do so. Let the bride be the only one who's wearing white. You should at least try out your look once or twice before the event. Get dressed completely with all the accessories so you have time to notice mismatched items and find other, more suitable ones to fit your outfit. Even if the dress code states casual attire, this does not guarantee you can wear jeans or even shorts, unless you are told so. Stick to a smart casual outfit to avoid appearing disrespectful.